Additional floor for Primrose Baby Windmill. A new product has just been released; the Sylvanian Baby bathroom. Note: This product does not come with any figures. 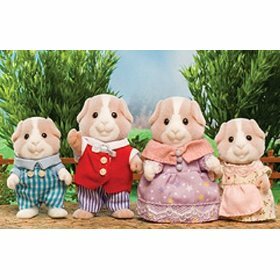 The guinea pig family includes Andrew, Peter, Penny and Nicola Pettyfur. It also includes the guinea pig babies Simon and Lindsay Pettyfur which come with a bed, one each, blue for Simon and pink for Lindsay. They also each come with a bottle. Each figure comes with a pair of clothes that are removable and can be put on a different figure. You can buy all of the parts to the playground separately. It includes a beautiful baby playground with two pretty wendy houses. 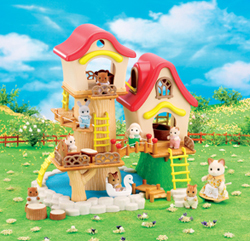 Turn the handle and watch your Sylvanians whirl round and round. Turn the handle to rotate the ferris wheel. The baby train playhouse includes a climbing frame, ladders, slide and a picnic table. Ella Underwood's personality is still developing but so far she is showing signs of being a great thinker and just loves to sit on the caravan and watch the world go by. Hugh Underwood has already made his mark on Sylvania and is showing a great interest in construction of buildings. 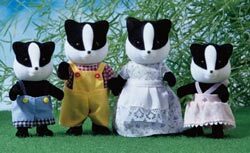 The Badger Family are known in Sylvania as the Underwoods and includes Father Benjamin Underwood, Mother Beatrix Underwood, Brother Byron Underwood and Sister Bess Underwood. Benjamin Underwood and his family are wandering Sylvania in their caravan. Benjamin is an expert at mending broken furniture and putting up shelves. Beatrix Underwood is a very capable badger indeed. Her father had always inspired her with his motoring stories and so from an early age, Beatrix became interested in the mechanics of any vehicle with wheels. Byron Underwood takes after his grandfather who was the Sylvanian society photographer of his day. Bess Underwood is known for her striking features, and her beauty is the talk of Sylvania.